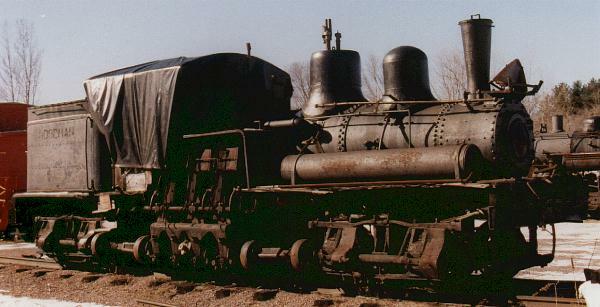 This page is an unofficial Mid-Continent Railway Museum site. The information and pictures presented here are personal comments and observations of the author and do not represent the position of the museum or its officers and directors. This site is for fun and information. 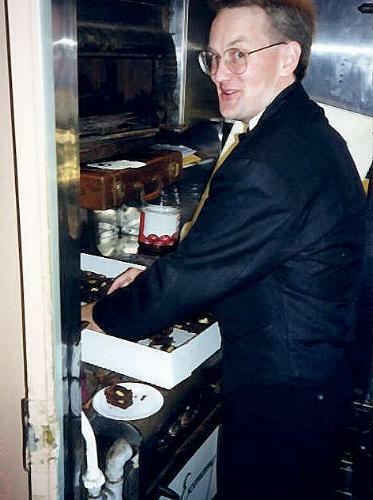 Snow Train '99 was a great time. 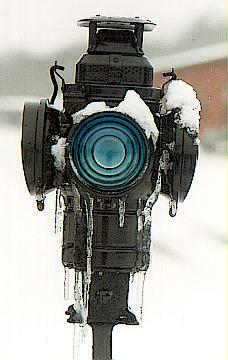 See views ofSnow Train '99. Engineer Warren Tisler, firemen Stan Searing, Ken Hojnacki. Recording by Stan Searing. 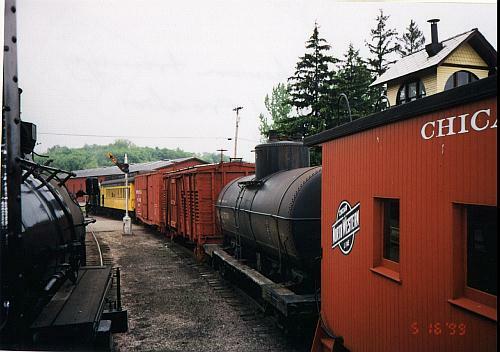 The Mid-Continent Railway Museum in North Freedom, Wisconsin opened in 1963 on a branch line of the Chicago & North Western Railway. 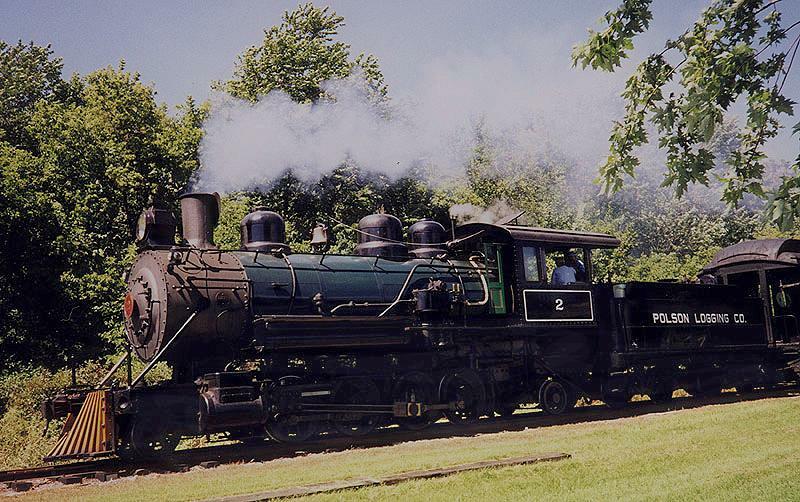 Since that time, the volunteer members of the museum have restored several steam locomotives and pieces of rolling stock for both display and operation. Trains run from mid-May thru mid-October. Special events are held for Autumn Color weekends in October, Santa Train on Thanksgiving weekend, and the annual winter spectacular, Snow Train, held Presidents day weekend in February. For more information, the link below will take you to the official museum site. Special event information will be included from time to time in the Mail Crane department. 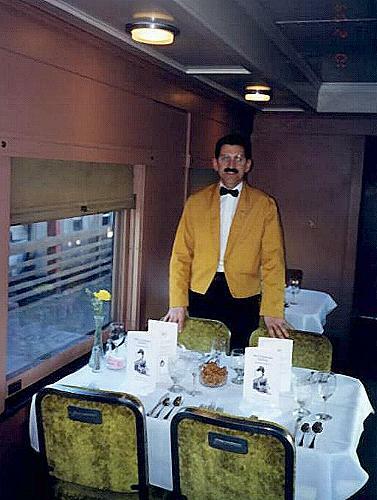 Service is "First Class" during Snow Train, Autumn Color and Santa Express. 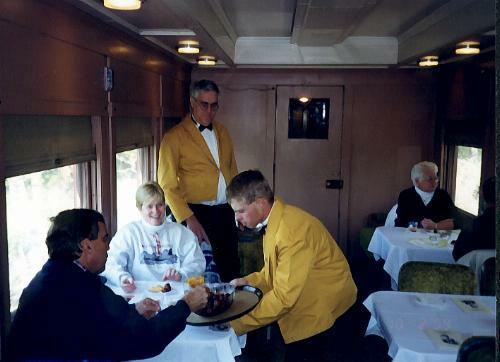 Serving up hor d'oeurves in Soo Line lounge 2017 are Bob Ristow and Robert Hasheider during Santa Express, 1999. Safety really does come first at MidContinent. That's why anyone wanting to work in train service must go through a progressive training program before working on the trains. It starts with safety and rules classes taught by professional railroaders and MidContinent veterans. 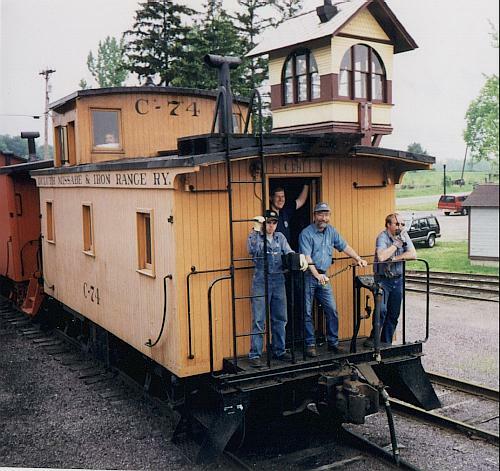 Here, instructor Fred Vergennes (far right) demonstrates backing a train while students observe. 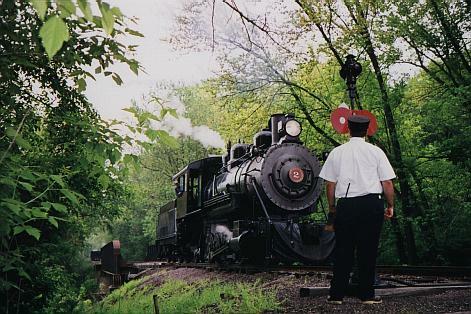 As the Saginaw Timber #2 waits to complete its runaround on the passing track at North Freedom, the brakeman's training train backs into a siding. Student brakemen learn about brakes and brake tests, coupling, signalling and much more before they begin student trips under the guidance of a qualified brakeman. Here, Glen Kwarciany lines the switch for the Saginaw 2 to make it's runaround. Even though radios are carried, most routine signalling is true to the early 1900's character of MidContinent and is done by hand. 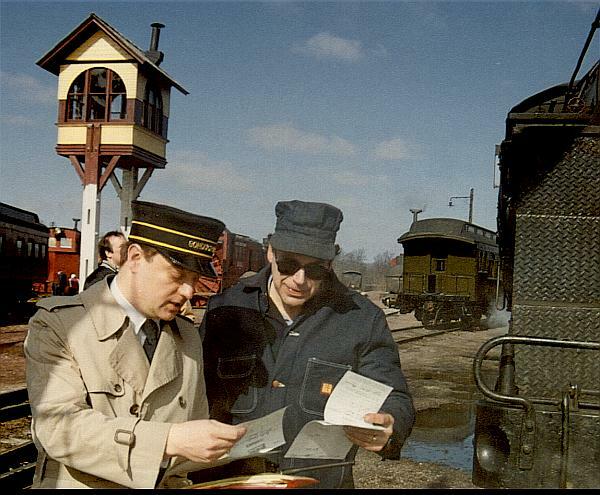 After passing their qualification and serving as brakeman for a required time, they can move on to train as a conductor or locomotive fireman. 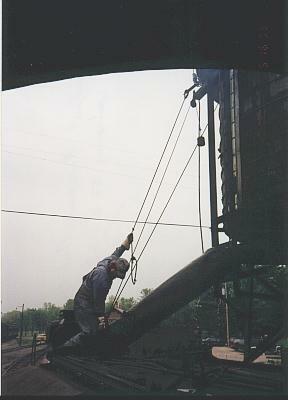 Fireman instructor Kenny Ristow reviews student John Decker on his qualifying trip, 9/5/99. On his first official day as a qualified fireman, Phil Blinderman takes water at North Freedom. 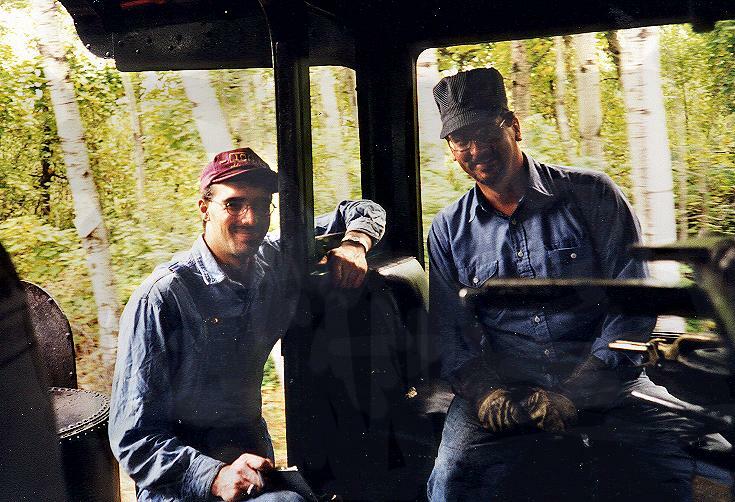 For information about joining the fun and hard work of operating antique railroad equipment, contact MidContinent via the link at the bottom of the page. Maintenance of steam locomotives is also a high priority. 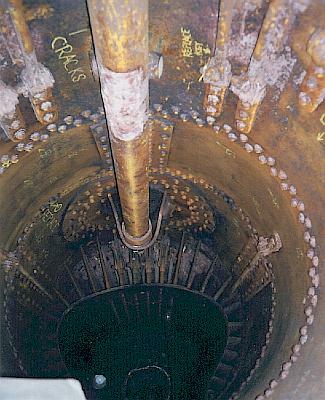 The boiler is washed and inspections done every 30 days. More indepth inspections are done at other intervals. 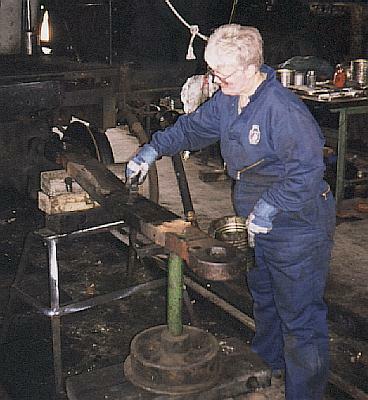 In the first photo, Marge Slack is cleaning the drawbar between the engine and tender which has been removed for inspection. Maintaining locomotives is hard, heavy work. 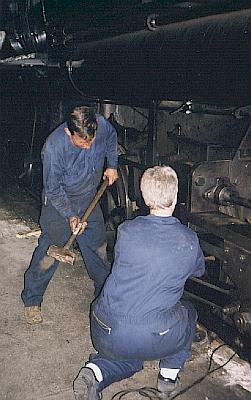 Ed Doench and Marge Slack work on some "slight adjustments"
Work on the Western Coal & Coke #1 progresses slowly. 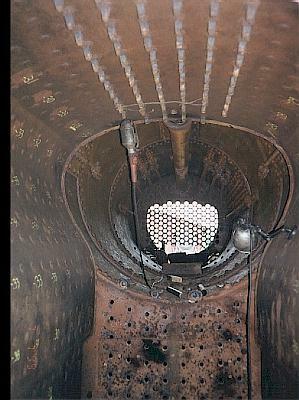 Here are views from the firebox and smokebox, respectively, with markings noting areas needing attention. With many shop folks pressed into train service during the operating season, repair work will pick up in the fall. MidContinent members voted in some major changes regarding the operation of the museum at a special meeting in June. 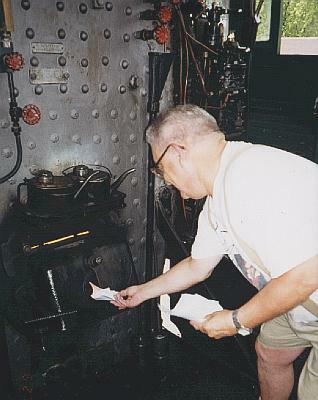 The next day, Secretary Jim Neubauer destroys the ballots, appropriately enough in the firebox of Saginaw Timber #2. The Goodman Lumber Company operated a logging railroad in northern Wisconsin, where Shay #9 was caught working in Goodman on April 25, 1947. Goodman Shay #9 is now part of the Mid-Continent collection. A group of members is investigating a fundraising campaign to restore #9 to operation. Stay tuned for progress. People are what make Mid-Continent go and grow. Visit some of the hard working volunteers doing what they love best.